"A special thanks to you Willow and Vida Events for all the organizing and administrative work you do to make this event better and better every year, we wouldn’t be where we are if it wasn’t for all your hard work and effort." Once again the Building Trades of Alberta (BTA) and Vida Events stepped up to the plate to hit a weekend of team building, family fun, and fundraising out of the park! There's a whole lot more than peanuts and Cracker Jacks at this annual event. This year we raised over $2,600.00 for the BTA Charitable Foundation. We loaded the bases with camping, a silent auction, a tug of war competition, and more. Thank you for sharing the day with us and cheering on your favourite Slugfest teams! Visit the Solidarity Slugfest website for details and photos of last year's action. New and familiar Slugfest fans gathered at Okotoks On Deck for a great weekend of slo-pitch, fundraising, and family fun. Seven teams consisting of Building Trades of Alberta members demonstrated outstanding camaraderie and sportsmanship throughout the skills competition and tournament games. A roving magician, glitter tattoo artist, and dunk tank entertained those off the field, while a silent auction and 50/50 draw raised over $4,500 for the Calgary Poppy Fund & Veterans' Food Bank! Congratulations to the Carpenters Local 2103 for taking 1st place in the tournament! Second place went to the Plumbers & Pipefitters Local 496, and 3rd to the Insulators Local 110. Thank you to all sponsors, volunteers, and attendees for another successful event! 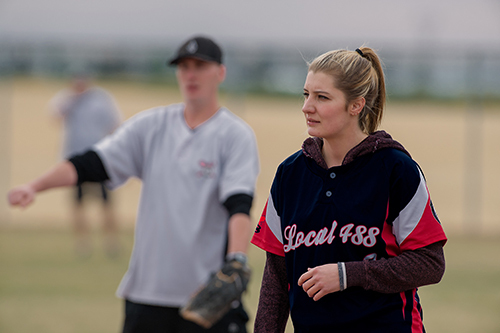 The Building Trades of Alberta, Vida Events and Affiliated Tournament Unions host a recreational slo-pitch tournament at the Okotoks On Deck Recreation Park called the Solidarity SlugFest. This annual tournament is an opportunity for the Building Trades of Alberta affiliated unions to celebrate the camaraderie within the trades and have some fun with family and friends. This is a family friendly event that is fun for all ages. With camping available right on-site we encourage players and their families and friends to join us for the entire weekend and take in all the activities. In 2015 over $5,000 was raised in support of the Veteran’s Food Bank and the Building Trades Charitable Foundation. Members from at least eight Southern & Northern Alberta Trade Unions came together on September 12-13th at the Okotoks On Deck Recreation Park to compete in the 3rd Annual Solidarity SlugFest slo-pitch tournament. Activities included bouncy castles, air brush tattoos, silent auction, 50/50, dunk tank and a roving magician/balloon twister. We are proud to continually support the Building Trades of Alberta Charitable Foundation and the Calgary Poppy Fund & Veterans Food Bank through these annual tournaments and we are proud to share that a total of $5691.31 was raised at the 2015 Solidarity SlugFest tournament. Congrats to the organizing committee, players, spectators, supporters and our are generous sponsors. Members from seven Southern & Northern Alberta Trade Unions came together on September 5-7th at the Okotoks On Deck Recreation Park to compete in the 2nd Annual Solidarity SlugFest slo-pitch tournament. Through a silent auction, 50/50 draw and the team competition $5000 was raised in support of the Building Trades of Alberta Charitable Foundation and the Calgary Poppy Fund & Veterans Food Bank. Thank you to all of our volunteers and generous sponsors/supporters for making this event a success. And, a BIG Congratulations to the Operating Engineers Local 955 for taking home the trophy!!! Check out the event photos HERE! Members from six different Southern Alberta Trade Unions came together on September 28-29th at the Okotoks On Deck Recreation Park to compete in the 1st Annual Solidarity SlugFest slo-pitch tournament. With a total of 7 teams registered and many family members and friends in attendance the weekend included a 50/50 in support of the Building Trades of AB Charitable Foundation, a variety of activities and entertainment for all ages, player giveaway swag bags, tournament champions and best dressed team prizing and lots of great camaraderie between union members and representatives. A BIG thank you to all of our sponsors, supporters and the organizing committee for pulling off such a great event on such a short timeline. CONGRATS to the Ironworkers Local 725 White team for taking 1st place!